iPhone 8 is surely going to enthrall your aspirations with its powerful features and all-new glorious design. Completely loaded with a glass design, this smartphone deserves protection from unwanted bumps, drops, and any kind of damage. While there are ample amount of cases available on the market, the bumper cases with minimalistic size can be a cool choice to make. Today, in this article of ours, we have listed some of the best iPhone 8 bumper cases under $20 for you. While searching for the top-rated bumper cases for iPhone 8, we have picked up only those that not only deliver maximum protection to your device but also let you flaunt it with style. The ones listed here are the most protective yet surprisingly stylish. 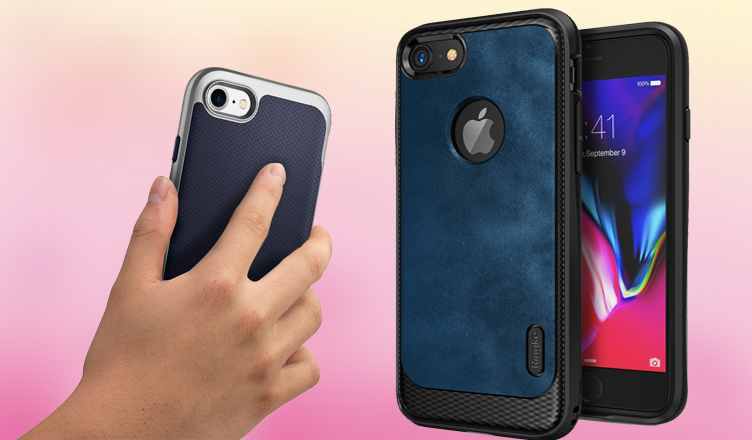 Crafted from high-grade materials, these cases make a great pair with your iPhone 8. So, let’s head on to grab the best iPhone 8 bumper cases for you. It features a two-part design. One is the shock absorbing layer and another is the rigid bumper. Designed with air cushion technology, the bumper safeguards your phone from heavy drops and falls. The design is such that it form fits the contours of your iPhone 8; hence, keeps it slim and sleek. You can easily slide it into your pocket and take it out without any hindrance when needed. Are you looking for a bumper case that provides protection to your iPhone 8 without hiding its gorgeous design? If yes then the clear bumper case from Supcase is the one for you. Featuring a grip flexible bumper and crystal clear back made from a scratch resistant material, it helps you keep your phone look like the new one for a long time. The raised bezels prevent the camera from touching the ground. Further, the port plugs keep away dust and dents from nesting over so that they always remain clean. This heavy-duty bumper case is made with a combination of polycarbonate exterior and TPU (thermoplastic polyurethane) core. Thus, it offers double layered protection to your device. The soft interior safeguards your phone against external shock and other impacts. The detachable belt holster enables you to carry your device conveniently while traveling. Moreover, you also get a built-in screen protector along with this bumper case. Ringke presents to you that provides style besides protection to your phone. With its impressive design, this case perfectly complements your iPhone 8. It is light in weight and slim in design. Furthermore, the scratch resistant material ensures the safety of your device against scratches, cuts, and other damages. The exact cutouts for the ports, buttons, camera, and speakers enable you to access your phone’s features without any hassles. Here is yet another option to enhance your phone’s style with the best bumper case. With a crystal clear finish, you can flawlessly showcase the original design of your iPhone 8. The elevated bezels around the camera and the screen keep away your phone’s screen and camera lens from scratches or scuffs when you place it on an even surface. This minimalistic case is light in weight and adds minimal bulk to your phone. Available in a pool of different colors, this case poses military-grade protection to your iPhone 8. Crafted from shock absorbent and impact resistant materials, this case offers a slim fit to your device. It also offers a firm grip while holding the phone in your hands; hence you can free yourself from the worries of your phone slipping out from your hold. The matte finish and geometric texture enhance the beauty as well as protection of your device. With a beautiful combination of crystal clear back and hard bumper available in variant colors, this case is something that would make your iPhone 8 look great. This hybrid case prevents your anti-yellowing effect from your phone. The air pockets inside the corners offer ultimate protection from heavy drops and falls. Further, the elevated lip and edges keep your phone from touching the ground; hence safeguards it against scratches. The precise cutouts offer easy access to your phone’s functionalities. It is specifically designed to perfectly fit your iPhone 8. This case features shockproof technology. So your phone gets the capability to withstand heavy falls. Its semi-translucent framing reveals the original design of your iPhone 8 and also provides you with a natural feel while you hold it in your hands. It is one of the perfect iPhone accessories that exactly goes with your iPhone 8’s style. Which of the above listed some of the best iPhone 8 bumper cases would you buy for your precious smartphone? Do write to us about your choices and views in the comments section.